When you have seperation, pour the mixture into a container lined with a couple of layers of cheesecloth. 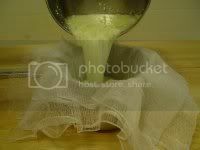 Tie up the cheesecloth and pour out the whey. 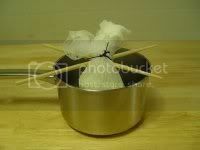 Suspend the cheesecloth-wrapped bundle over a container (I just used the same one) to finish draining. I used twist-ties left over from other applications to tie the bag up, and then tie it to a couple of chopsticks, which were used to suspend it over the container. This will all go into the fridge for at least an hour, and up to three hours if you wish. 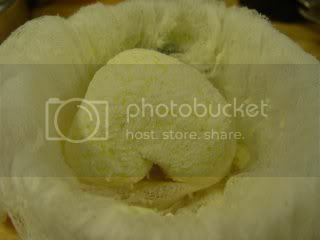 When it's done, you can remove the cheesecloth if you wish, and store the cheese for up to a week. You don't have to stick with lemon, of course. Lime would be very nice, indeed. The recipe that I based mine off of used cider vinegar. 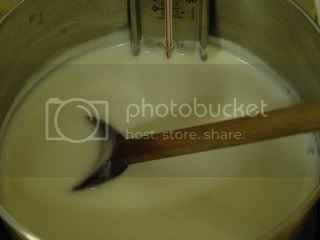 Of course, it's the acidity that curdles the milk, making it possible to turn it into cheese. The problem that I see with using straight vinegar is that it limits you a bit on flavor. I decided to go with a lemon base, and when it didn't seem acidic enough to my mind, I thought that a little white wine vinegar would compliment the flavor nicely. What's it good for? Well, you could just eat it straight. It is quite good on its own. Today I crumbled some up over some shredded chicken leftover from a Mexican restaurant the other night. It also crumbles quite nicely into salads. I think your imagination is the only limit. Hah! Story of my life. My husband tells me, "You always get an A for effort and an F at following directions... it's a good thing whatever you try seems to always work." After going to class every week with something just a bit out of the box, my cake class teacher told me during my last class in April, "I'm always excited to see what you come up with next because I KNOW you aren't going to follow the directions I gave you the week before." 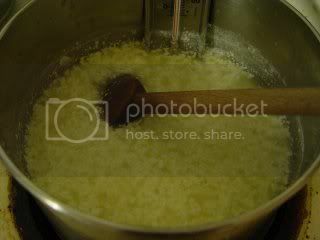 Lemon cheese... dang, how I wish I could still eat cheese... sounds yummy!